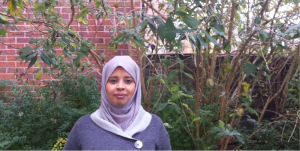 I am Sabah Ismile Alsomali, PhD third year student at the University of Salford, School: Nursing, Midwifery, and Social Work and Social Sciences. I arrived in Manchester in September 2014, eager to begin my doctoral studies in a new country, as an international student from the Kingdom of Saudi Arabia. I chose to travel to the UK for my degree to broaden my academic and personal horizons. This unique, University of Salford is famous in my country for its outstanding performance in the educational research, and the academic staff is well known in their fields of expertise. In my opinion, an academic expertise with a high reputation in the research field is crucial, and I was searching for a level of knowledge and experience, which I found at the School of Nursing, Midwifery, Social Work and Social Science. The lectures and seminars from expertise were helpful to guide and direct me, and I also learned various research skills, as well as, acquired insightful knowledge related to my research and overall personal development. I found the facilities and resources at the University of Salford outstanding. The university is well organised, and the support team is always available and helpful. The diversity of my fellow research students from all over the world and the sheer range of subjects make a large academic community of mutually supportive researchers. We are encouraged to share our work, via a series of seminars on the research approaches and issues. For example, I had the opportunity to participate in several seminars in the university, such as I was one of the speakers on International Nursing Day, and I presented my research project on the celebration of Postgraduate Research Day. I was also, one of the organisers and speakers on the event of Saudi National Day at University of Salford. In addition to this, I gave a lecture to new students of Master’s Degree at the University. My first year of studying PhD at the University of Salford was quite busy because I spent a lot of time reading relevant literature, attended seminars and workshops, which helped me to understand the research methods and methodology. In addition to this, I prepared for my interim assessment research proposal, which was scheduled in late June 2015. The interim assessment was the most important evaluation in my PhD work. The examiners were extremely helpful and friendly and gave some valuable comments. Following this, my supervisor and I were asked to leave the room. The most stressful moment was the waiting time for the results outside the office with my supervisor. After a period of 10 minutes, we were informed that I passed my interim assessment and can now consider myself a PhD student. The interim assessment was a turning point for me in this research work. Although, I completed all the preparation work, for example, literature review, research methods; I felt that the second year would be the year marked, as the initiating year of the research and hard work. The second year was very different from the first one. Now that I had a clear plan of what I wanted to do, all I had to do is to work and the second year would be the year marked as the initiating year of the research and hard work. The second year was hard in a way because the excitement of the first year was over, but the end was still out of reach. From my experience, those who decide to drop out, often do so, by the end of the second year. According to plan, I wrote an initial draft of my thesis using the data available from the existing literature, printed research tools materials. By the time, I gained a full understanding of the subject, I conducted a field trip to Saudi Arabia. Due to the nature of my thesis, the fieldwork for data collection was conducted for the second year of my research as planned in Saudi Arabia, which involved survey questionnaire with the people with T2DM and face-to-face semi-structured interviews with health care professionals as well as people with T2DM. I acquired more knowledge and experience from data collection in the field. Personally, I acquired knowledge of SPSS and doing quantitative data analysis with the help of SPSS. During the second year of PhD at the University of Salford, in the United Kingdom, I would describe myself as becoming a competent researcher evidenced by co-authoring two publications with my supervisor and conference presentation. I prepared for my Internal Evaluation (IE) exam, which was scheduled in late September 2016. The internal evaluation was the most important evaluation in my PhD work. The sequence of my second year IE evaluation was somewhat similar to what happened in the first year IE evaluation. After the question-answer by the panel, my supervisory team and I were asked to leave the room and were called after few minutes, later to be told that I passed my PhD internal evaluation and can now proceed with PhD third year study. I was very happy. The examiners of this panel were also very helpful and friendly, like the examiners in the first year panel. I enjoyed the second year more than the previous year. First of all, I felt more confident in the area of my study and gained a deeper knowledge of the topic when I did my data collection and data analysis. I felt optimistic about finishing my degree on time when I passed my Internal Evaluation exam. At the beginning of the course of my PhD, third year journey, I was given many chances to present my work at conferences. The gains from sharing my work with a wider audience are tremendous and valuable. These exceptional experiences will not only give me insights into my work but will also give me a good idea of what it means to be a part of a wider academic community. I have also made progress in disseminating my work with a poster, accepted at a conference at Manchester University. In my final year, I will be determined to make most of the opportunities and work, as hard as, I can. Due to the nature of my research study, I am positive about the possibility to complete the required amount of work in one year. Although third year bears a lot of responsibilities, with the major material of my work prepared and written, I feel confident that I would be able to use the time after data collection effectively to improve the drafts, I already have. The University Salford has fantastic resources, offering access to everything you need to do your PhD, such as data sets and 24/7 library facilities. The community between PhD students at the School of Nursing, Midwifery, Social Work and Social Sciences was imperative to me. It fosters a vibrant group of people studying different things, and with a strong sense of collaboration and support, we were able to share expertise and advice within this community. I appreciate the help from other students, who were going through similar things as I was going through. I always felt welcomed by the School staff and the city. It has given me access to a new culture and a new life, which is multicultural, yet integrated. The School also has excellent industrial connections and international links, so I was able to understand a different way of thinking and understanding. The city of Manchester is a great place for studying. It is known as the “best student city.” The city is multicultural and lively and has lots of tourist attractions, museums, galleries, and on-going events throughout the year. The vibrant campus of the University of Salford is only a short travel from Manchester Central. I found myself in the middle of great things happening, which influenced my personal development and learning that I will take to my home country when I complete my PhD. Finally, I can say that at the University of Salford, challenges may seem big, but they filled my life with excitement and helped me to realise my dreams with more confidence and enthusiasm. It is very interested writing and I can’t stop reading Sabah PhD experience. I hope this article will inspire a lot of people. Thank you very much sharing with us your PhD experience.